Watching this new "Last Hope" trailer leaves me with a powerful urge to say, "Meet the new Borderlands—same as the old Borderlands," but that's not really a surprise, is it? Nor is it even something to complain about, really. 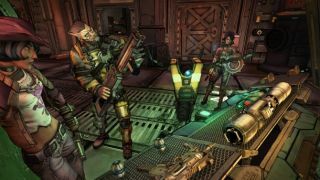 After all, there are worse things you could end up with than more Borderlands , especially when Borderlands: The Pre-Sequel lets you dress Claptrap up like a heavily-armed, hat-wearing pirate ship. Yes indeed, this trailer has it all: Guns, anti-heroes, guns, a psychotically-cheerful unicycle robot, Handsome Jack, guns, a catchy song, cel-shading, guns, explosions, guns, low gravity, vehicles, guns, vehicles with guns, and guns. What more could you ask for? Borderlands: The Pre-Sequel comes out on October 14.